Jenine and I use spaghetti squash all the time....we slice in half, place in a corningware bowl face down, and fill with about one inch of water. Bake 40 minutes @ 350. Cooks perfect every time. 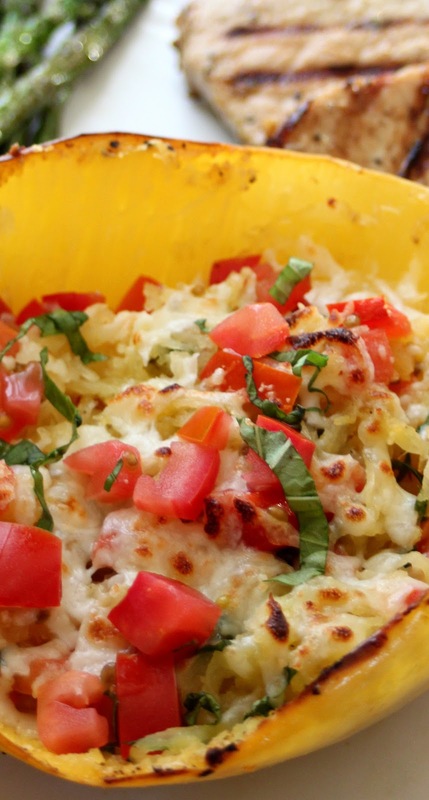 I love spaghetti squash and this sounds like a delicious recipe to try. Thanks for posting. How many calories is on this meal? Hi Jennahhh! Calories are about 225 per serving. Do you eat the shell. SS is new to me. You can eat the shell, I don't but I'm always amazed at my mother in law, she LOVES the shell! It has to be really well cooked or it can be pretty tough. Thanks! Let me know how it turns out if you try it! Made this tonight but changed it slightly. Used Parmesean cheese since that's what I had. Also added just a little cream and some left over chicken breast to make this a main course. It turned out very delicious! This was delicious! I made this for me and my husband as a breakfast dish! (Along with scrambled eggs and very crispy bacon) He loved it! Thanks Lisa, I sent her a message on Facebook. Do you have the total nutritional breakdown with carbs, etc.? I made it tonight and it's DELISH!!! Thank you!! This was delish, thanks for the recipe!! this will be my first time trying spaghetti squash...love that this isn't a fussy recipe with a mile long list of ingredients, but looks delicious! perfect for our lunch today! A facebook friend makes this a couple of times a week. I need something like this as I am a diabetic. This fits in perfectly. Many, many thanks. I made this last night. Used canned diced tomatoes, and a mix of colby jack and muenster because that's what I had. It was a delicious! We both loved it. 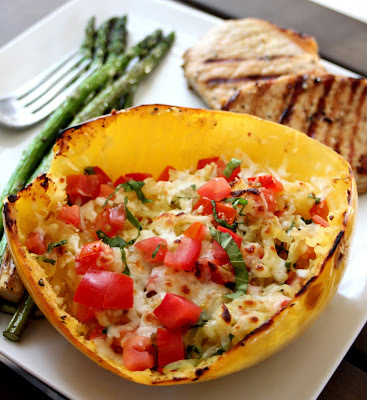 Why is this called 'Margherita' Spaghetti Squash? It sounds like a great recipe. This was wonderful and I'm really loving spaghetti squash, even as a side vegetable when cooked this way. However I can't ever cut the stinkin thing!! lol. I can only eat it when my husband is home so he can muscle through cutting the squash for five minutes. lol. Anyone have any helpful tips on this? Hahaha, Kendra I completely agree! It is the toughest part. My husband INSISTED I buy him a big cleaver for Christmas a couple of years ago as a joke. It is now the ONLY tool I have that's big enough to cut through those big squash suckers! It cuts easily if you start a little cut to set the knife in, then turn it around and tap the end of the knife on a cutting board or something solid! I cut all my squash this way. It works great! How kid frienly is this? I know growing up my grandma made SS all the time and I loved it. My daughter on the other hates anything veggie but I have been making small switches here and there and telling her its this or that and she will eat it. I did learn quickly to not tell her after she ate it what it was. I would like to try this because it looks amazing. My little boy likes it, he loves anything with butter, so I put a little butter on his and a little extra cheese. I skip the basil, but he LOVES the tomatoes. Give it a try Alishia! Let me know if it works!